Is it snowing in Arolla ?¡Gracias! 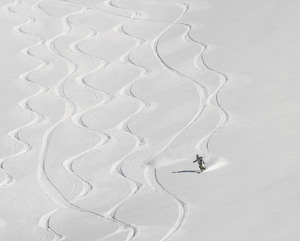 Arolla is a hidden gem of a ski resort that the snow-forecast.com staff include with some reluctance. It is certainly not to everyone's tastes - the piste skiing here is very limited, the surface drags are tedious, nightlife is non-existent and it's a long bus ride from Sion on an infrequent and expensive post-bus. The alternative, to drive here, is not for the faint hearted because the steep and winding road up from Les Haudres can get very treacherous - it would be crazy (and illegal) to visit without chains. 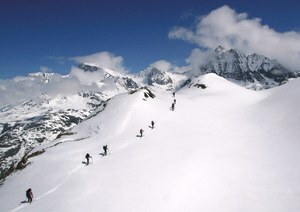 Geographically, Arolla is not very far from Verbier and close enough to Zermatt to see the Matterhorn and Dent Blanche. Sleepy Arolla could hardly be a more different place than those two. Why do we come back to Arolla again and again? There are several factors that make it a great destination. First, the off-piste here is really something and the combination of remoteness and the dreadful surface lifts with pulleys that drop dollops of grease on unsuspecting skiers mean that Arolla tends to stay untracked for much longer - even the inbound off-piste is usually not tracked out for a week after new snow. Second, if you are comfortable in remote back-country and don't mind walking there is much more to go at - but only if the avalanche risk is low enough and even then this is transceiver and shovel terrain. There are a huge variety of testing routes back to the road in the valley along a 5km stretch between La Gouille and Arolla - vast open bowls for the top 700m with various thickly wooded or steep avalanche-prone chutes for the bottom bit. Third, Arolla is cheap by Swiss standards, and half-price January skiing in Arolla is even better value (something like CHF160 for the entire month in 2008). The catch is that, in January, the low sun barely sees Arolla's slopes and it can be bitingly cold on those long drag lifts. For the less financially challenged there is magnificent heli-skiing available. Last,and perhaps most importantly, the location, close to the main Alpine divide, makes Arolla relatively snow-sure and there is a tremendous difference between getting a 5cm dusting at Verbier, Crans and Nendaz and the 10-15cm that would fall here on the same night. Being high and cold means that snow tends to be pretty powdery for the Alps but one problem is that the exposed aspect also means that an unfavourable wind can strip a metre of snow away overnight. 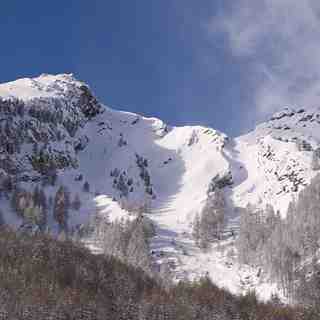 Above the trees, it can transform an off-piste powder wonderland into a boulder field. Thankfully, overnight ski repairs at the one shop in the village are very high quality. 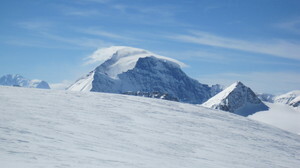 Fortunately, a strong down-slope southerly wind here tends not to "land" until about Evolene and so warm Foehn wind conditions are not nearly the problem here as they are in Zermatt.